(May 5, 2016) Weeks after arriving at Airside C, RumFish Grill’s aquarium is already a star attraction, with passengers often stopping to take a photo with the six-foot aquarium filled with colorful Florida fish. Now, people will get the chance to see how the 1,300-gallon tank got there. 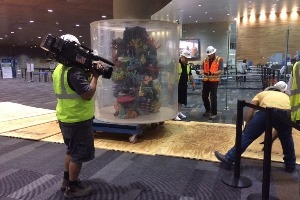 This Friday at 10 p.m., Animal Planet’s “Tanked” will air an episode showing viewers how the magnificent tank was designed and installed at Tampa International Airport. Also featured on the episode: TPA Vice President of Operations and Customer Service John Tiliacos and Concessions Director Laurie Noyes, who were a part of the big reveal. Installing the tank was not an easy project. With a challenging installation schedule, hosts Wayde King and Brett Raymer of Acrylic Tank Manufacturing were up against the clock to get the tank from the tarmac into the terminal overnight, before it began filling up with passengers. The tank was filled with fish indigenous to Tampa Bay and the Gulf of Mexico that can be seen from all angles. The massive cylindrical aquarium features more than 75 stunning and vibrant fish local to the Florida coast. The interior rockwork was completely sculpted by hand and includes an array of almost 200 individually molded corals. At the top of the 13,000 pound tank lives a giant life-like marlin that looks as if it’s jumping out of the tank and into the restaurant, operated by TPA Hospitality Partners.